Bandung is one of the most important cities to mention if one wants to talk about the history of Indonesian jazz. Jazz has been spotted early in this city, at least it could be traced since the 30’s and amazingly, jazz never fades away since then. Today there are several jazz communities established their existance in Bandung. 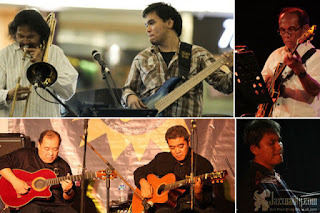 Once of them is TP Jazz (The Papandayan Jazz) . The TP Jazz Weekend, that’s the name of the regular twice a week event started in 2013 by the cooperation between The Papandayan and veteran blues/jazz harp man Mr. Hari Pochang. Located at the Mirten Lounge of The Papandayan hotel, TP Jazz Weekend is held on Friday and Sunday night, served totally free of any charge. This event has become one of the most favorite jazz destinations in Bandung. Comfy luxurious place but friendly and so jazzy. Many great local and international musicians have left their marks and brought good impressions back to where they came from. Now, here comes the good news. After 2 years of steady run, it’s time for TP Jazz to take another higher step or even better, huge leap: a jazz festival. 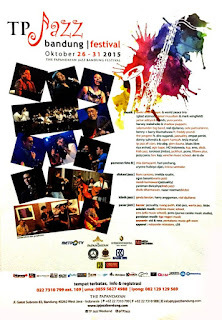 It’s simply called The Papandayan Jazz Bandung Festival or TP Jazz Bandung Festival (TPJBF). The first edition is going to take place no longer than next week. What’s amazing is that this festival isn’t going to be a 1, 2 or 3 but 6 day fest. It will involve no less than 6 stages, more than 30 shows and more than a hundred of artists, ranging from legends, seniors, today’s headliners, future stars and potential young talents. 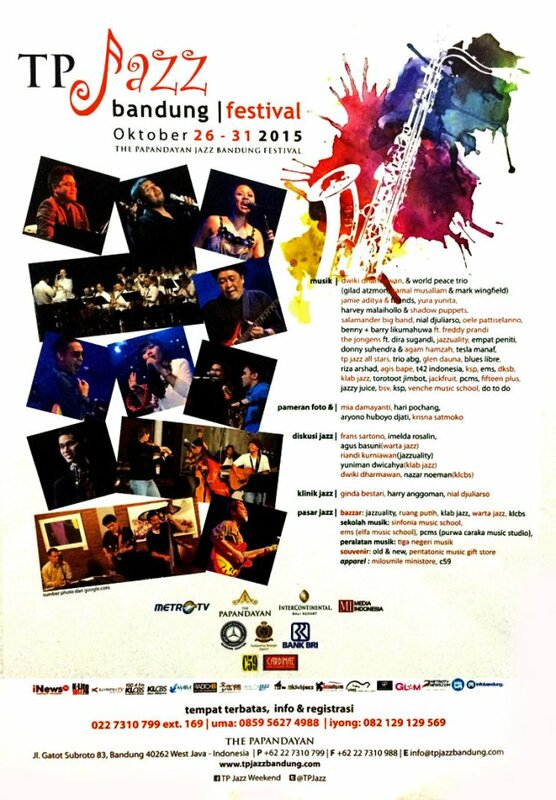 The 1st TP Jazz Bandung Festival 2015 will start next Monday until Saturday (26-31 October 2015). You can see the complete schedule for 6 days at the end of this article. A press conference was held on Monday, 19 October 2015. Representing the festival were Bobby Renaldi (the Grand Manager of The Papandayang Hotel), Hari Pochang (the curator of TP Jazz), Imelda Rosalin (representing the artists) and Aat Suratin (senior bandung’s cultural expert), plus Venche Manuhutu, the owner of Venche Music School who takes care of talents for TP Jazz Bandung Festival. They explained the background of this festival. 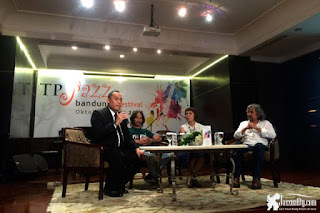 According to Bobby, TP Jazz Weekend was established 2 years ago to answer the lack of jazz playground in Bandung. He met and talk with Hari Pochang, and voila, the event was born. Since “Musicians need arena to express themselves,” says Imelda Rosalin, this regular event experienced fast growing. From once a week to twice a week, presenting famous musicians from local Bandung, Jakarta and other nearby cities, all the way to international artists. As they desire to provide an ‘address of jazz’ for musicians and jazz lovers, they came out with the idea in having a bigger and more spectacular event which is set to be an annual event.